Today, I was contemplating on what to eat since I have some errands to run in town with my mom. 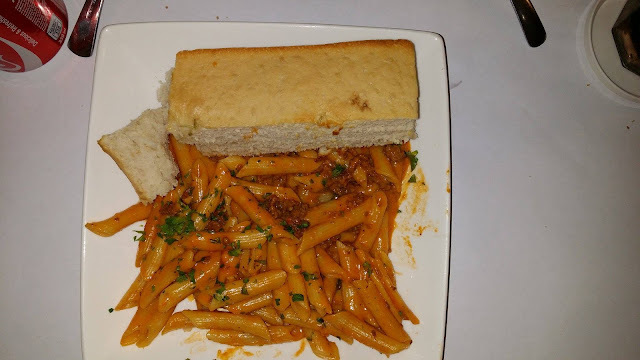 We crave for pasta that is why we dropped by Tiny Kitchen in F. Torres St. in Davao City. It is 2:00 pm (too late for lunch) but still, the place is packed with diners. You can hear the laughter and the nonstop chatting of people while the subtle sound of plates and glasses are banging in the background. This feels like a great place to dine and unwind with your friends and families. As you enter the premise, you can really feel at home. Tiny Kitchen is divided into two areas. 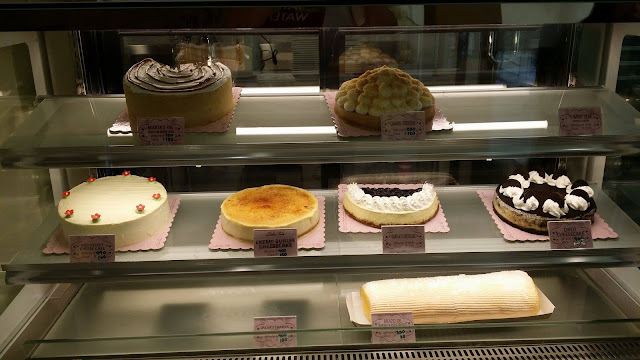 If you go to your right as you enter,, then you can see all their famous cakes and pastries. And if you head straight ahead, on your left are chairs and tables for people who want to order their special meals. The place is beautifully decorated with plates and pans as wall decors which makes the whole place cozy and homey. The vibe here really transports you to amazing restaurants in Spain. The servers are well attentive as well as courteous. I can even see the owner making sure the service is smooth as well as checking if the customers have a great time. This is a plus factor since most restaurant owners don't interact with customers these days. Since I was craving for a great pasta dish, I ordered their Chorizo y Tomato (P230). It is a penne pasta simmered with their homemade chorizos, tomatoes and thick cheese sauce. It comes with a freshly baked bread which makes this dish more sumptuous and appetizing. 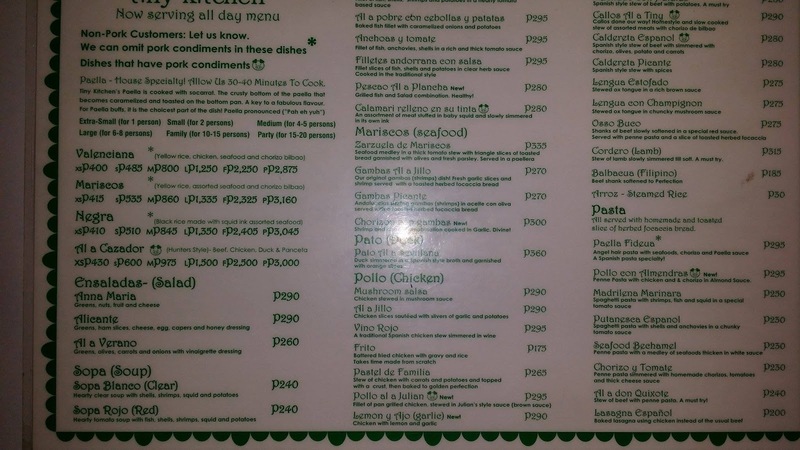 My mom ordered one of their specials – the Madrilena Marinara (P250). 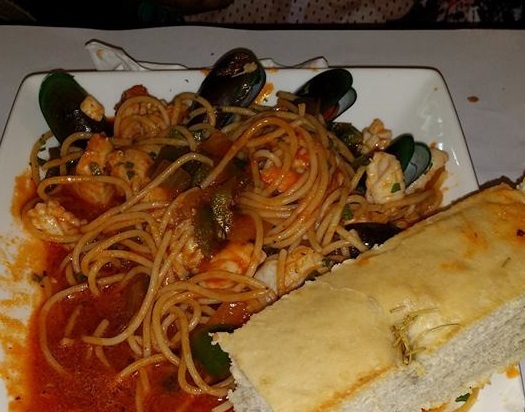 It is a spaghetti pasta with seafood delights of shrimps, fish and squid in a very delicious tomato sauce. The serving is so gracious for the price you paid for, which we really like. Since we just ordered the pasta, I happened to ask the waiter what is the specialty in Tiny Kitchen. He said they have the best Valenciana in town. So I will surely go back there for that next time. 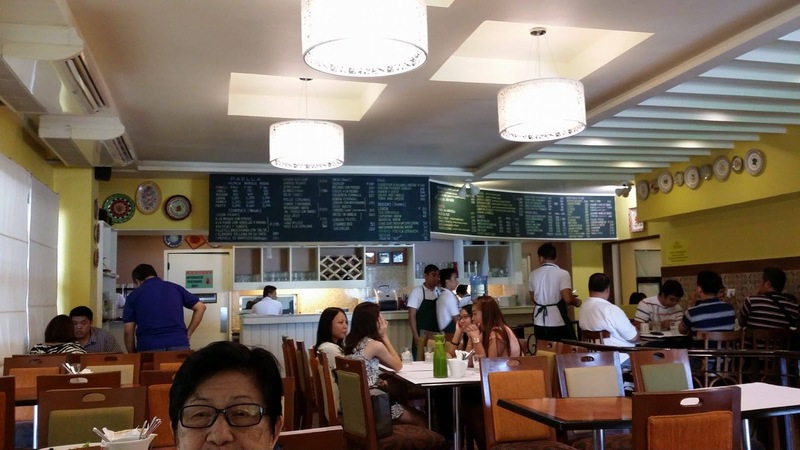 Aside from pasta and Valenciana, they also serve duck, chicken, seafood, pork and beef dishes. After we ate our pasta, we tried their famous desserts. Never ever leave Tiny Kitchen without sampling their pastry line. 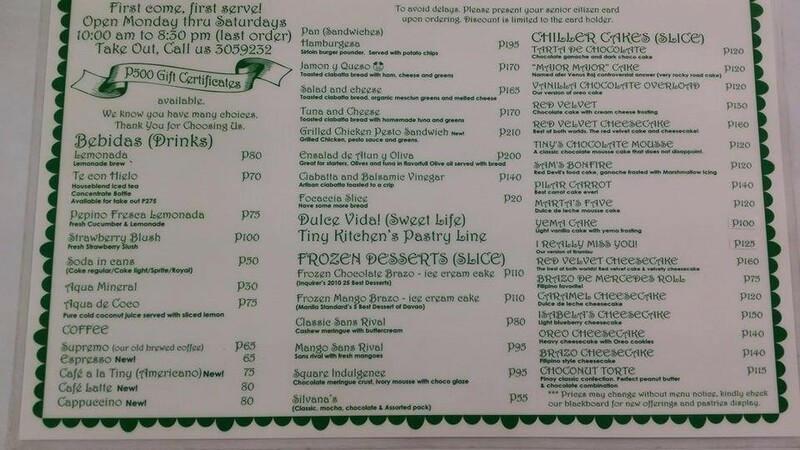 We ordered their sought after Red Velvet Cheesecake as well as their Frozen Mango Brazos. 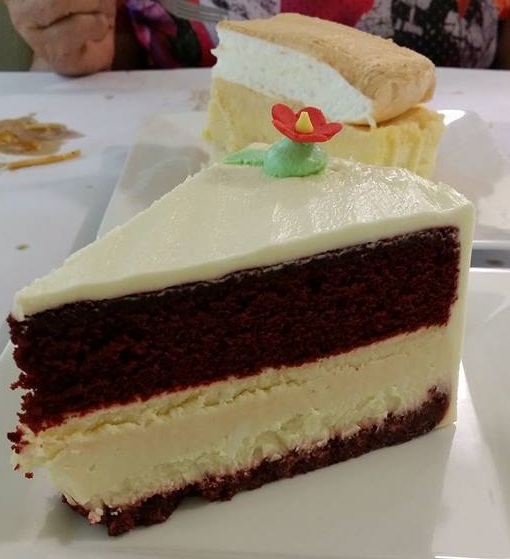 The velvet cake is super delicious. The cake is covered in white chocolate. The cheesecake is whipped to perfection with smooth textures; amazingly wonderful in your mouth. The Frozen Mango Brazos is named by the Manila Standard as one of 5 Best Desserts of Davao. 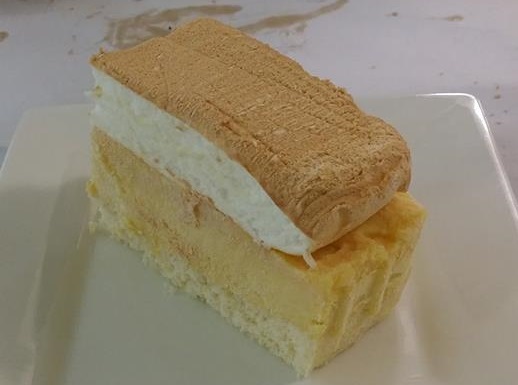 The brazo is fluffy and incredible. At the ice cream cake underneath, you can really taste the sweet ripe mango. But since it is an ice cream cake, it is hard to get by the fork. So you need to wait for it to melt slowly. 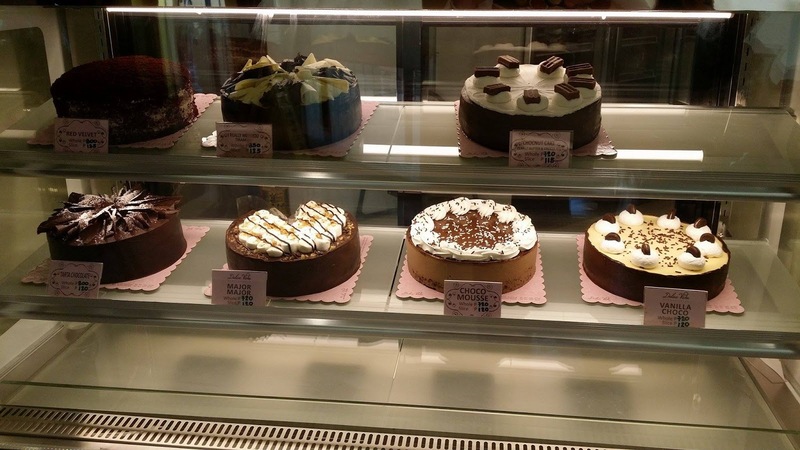 If you are in a hurry like us, just choose another pastry than their ice cream cakes. But overall, the food is simply the best! Usually, if the ambiance of the restaurant is somewhat classy and the food tastes great, then it surely connotes to a huge to pay at the end. But this is not the case in Tiny Kitchen. For the appetizing food that we ate plus the amazing service that they provide, the price is super affordable and cheap. 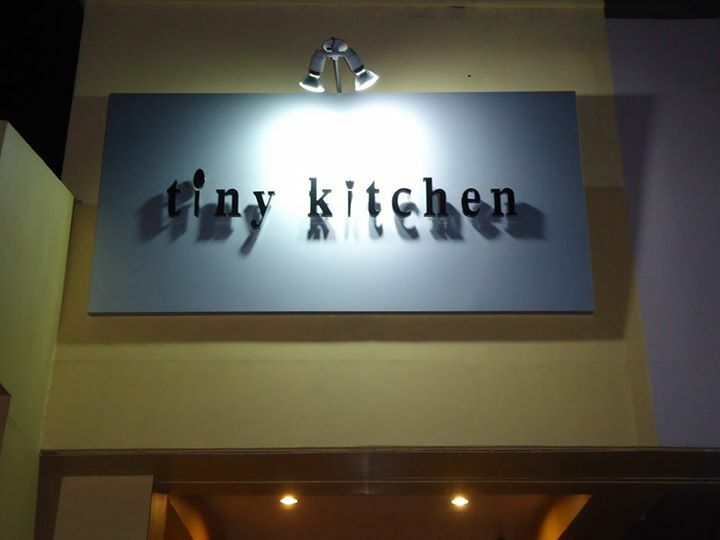 Tiny Kitchen is indeed a haven for a foodie like me. So what are you waiting for? When in Davao City, experience the wonderful taste of Spanish cuisine in the Tiny Kitchen Restaurant.